Can a Short Walk Boost Your Mood? | Guardian Angels of Home Health, Inc. 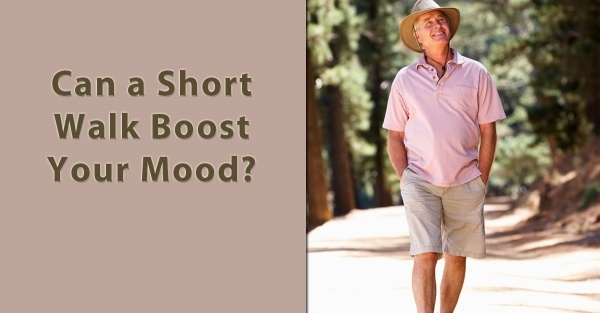 Guardian Angels of Home Health, Inc. > Blog > Uncategorized > Can a Short Walk Boost Your Mood? Numerous studies over the years have confirmed the many health benefits of walking including managing diabetes, high blood pressure, and weight, as well as lowering the risk of dementia, cancer, osteoarthritis, and more. Now a recent study finds that walking can also be good for the mind and soul by significantly boosting your mood. The researchers designed experiments to test the moods of 400 participants and how walking affected them. They found that a short walk – as little as 12 minutes – can combat negative emotions such as dread and improve mood. Study participants reported feeling more positive, self-assured, and attentive after a stroll. A short walk before completing a tough task or starting a stressful day can make all the difference. Source: Miller J, Krizan Z. Walking facilitates positive affect (even when expecting the opposite). Emotion, 2016 Aug; 16 (5): 775-785.